While the hand-in-glovers were busy amassing 'illusionary' wealth, there were several right-minded (no pun intended here) people that quietly went about their missions, and without their knowing accumulating 'karma'. Their passions were fuelled by causes larger than themselves which constrained them to 'doing' whatever they could within their means and made a difference. 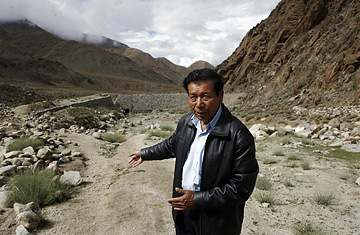 One such example is the little known Chewang Norphel, the 73-year-old civil engineer who has come up with a solution that won’t exactly save the ancient glaciers, but it could stave off a looming irrigation crisis, in Sakti a small village nesteld in the upper reaches of the Himalayas. Norphel has created artificial glaciers! Read about this here. Read the TIME article 'Ice Man' vs. Global Warminghere. See what I mean by the means justifying the end.